Publishing a web app to an Azure App Service is quite easy thing to do using Visual Studio but it certainly isn’t the best way to go with for enterprise solutions. Consider for example that you wish to deploy your application to different regions around the globe, using different application settings or build configurations. In case you choose Visual Studio this can be not only time consuming but also error prone. The real disadvantage though is that you don’t have full control of what is being deployed during the process. Ideally you would like to know more details about the deployment such as the build version to be released and if all the tests have been passed before the process starts. All these are possible using AppVeyor, a continuous integration solution capable of making the release process fast and more important reliable. AppVeyor is free for open-source projects but also provides several plans to meet the needs for enterprise solutions. There are 4 main steps you need to follow to configure CI/CD for your project in AppVeyor. Before moving on to the next steps, visit AppVeyor and sign in. It is recommended that use your GitHub account and if you don’t have any simply create one, it’s free. For this tutorial we will be using a Web App built with .NET Core and Angular that you can find here. In case you wish to follow along with this app simply fork the repository. To fork the repository, sign in to your GitHub account and visit the repository’s URL. Click the Fork button on the upper right and that’s it. 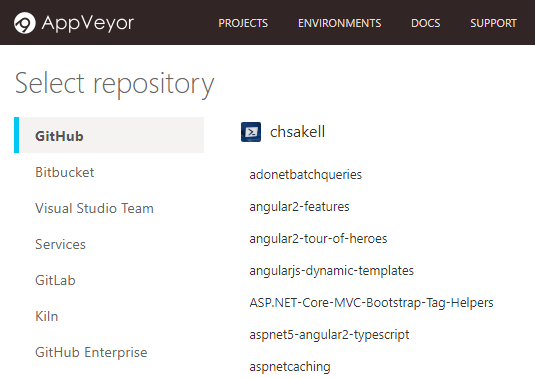 Back in AppVeyor, click Projects from the top menu, search for the forked repository in the GitHub tab and click the Add button on the right. AppVeyor requires to add an appveyor.yml file at the root of your repository that defines what do you want it to do with your project when you push changes. This file is already there for you so go ahead and open it. Following are the most important parts of the file. The above snipper tells AppVeyor to use the Visual Studio 2017 build worker image so that it can build the .NET Core application. An image has a pre-installed software ready to be used for processing your projects. It also informs AppVeyor to run a build every time you push a commit either in the master or the develop branches. Any commits to different branches will not trigger a build. file used by the Angular application. Before building the project it restores packages using the .NET Core CLI. Next it runs the dotnet publish command to produce the artifacts. When dotnet publish -c Release command finishes, the produced artifacts are stored in the \Online.Store\bin\Release\netcoreapp2.0\publish folder. The instruction tells AppVeyor to name the artifacts WebSite and ZIP them in a file named WebSite.zip. These artifacts will be available for deployment using the Web Deploy method. Try and push a simple change to your forked repository. AppVeyor will trigger a new build. To view your project’s build history, in the Projects page click the forked repository and select the History tab. You can check how a build looks like here. By default AppVeyor will send you an email saying if the build was successful or not. 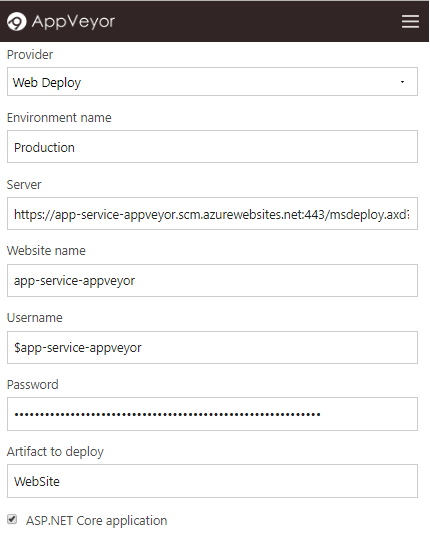 You will use the Web Deploy method to publish the artifacts of your builds up on your App Services in Azure. This will be done through AppVeyor Deployment Environments. 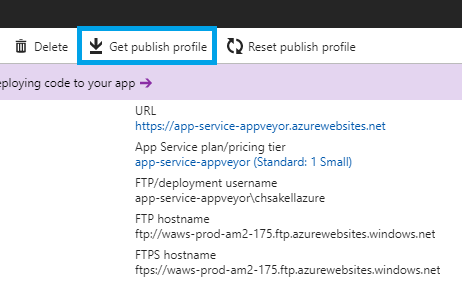 A deployment environment’s role is to connect to a specific Azure App Service and publish the artifacts for the selected build. In order to connect though to an App Service it needs to know the web deploy‘s credentials for that service. These credentials can be found in the publish profile of an App Service slot. 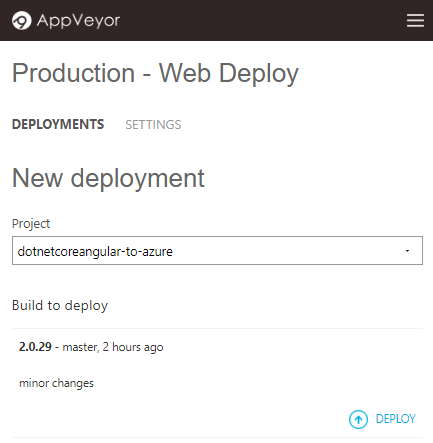 This means that there will be different deployment environments in AppVeyor for each App Service you create. Before continue on it’s good to know how an xml publish profile looks like. Assuming that you have already created an App Service in Azure Portal open the resource and in the main blade select Overview. Click the Get publish profile button to download the App Service’s publish profile. 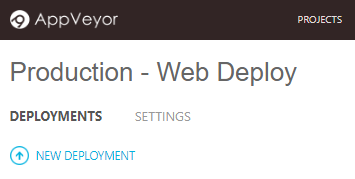 After filling the form click the Add environment button to create the deployment environment. To trigger a deployment manually, select the deployment environment you wish to use and click NEW DEPLOYMENT. 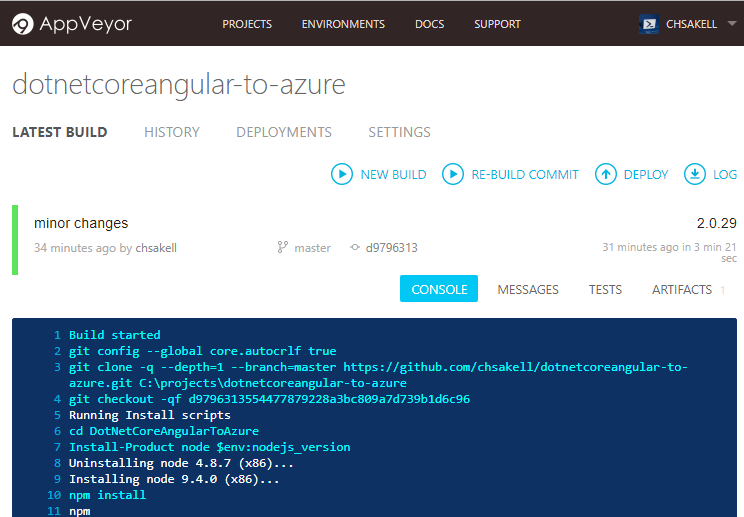 Next select the project and the build you want to be used for the deployment and click DEPLOY. The snippet above declares that you wish to use the Production deployment environment to trigger a deployment each time you push changes to the master branch. This means that the build will be triggered when you push either in the master or develop branch but only changes in the master branch will trigger a deployment. On the other hand, in case you wish to take the full control of the deployments and trigger them on demand and optionally passing a build version number you have to leverage AppVeyor’s REST APIs. In the Globally-Distributed Applications with Microsoft Azure e-book you will find PowerShell scripts that automate creating, updating and triggering of deployment environments. Notice that the scripts can take care to use specific deployment environments per App Service slots, meaning that each slot has each own deployment environment.